It comes down to whether you appreciate the conflations Ashbery artfully manages as he penetrates the psychic membrane between Steven's Supreme Fiction, that perfect of Ideal Types and their arrangements, with the material sphere that won't follow expectation, nor take direction. 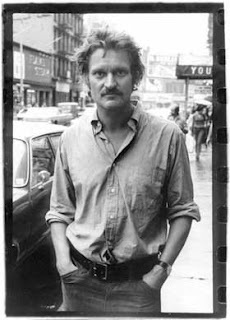 I happen to think that much of the interstices he investigates are results of artful wandering; Ashbery is a flaneur of his own musings, and the Proustian inspection provides their idiosyncratic, insular joys. Had I thought Ashbery overrated and a bore, I'd have turned my back on critical praise of him and left him cold; I have a habit of keeping my own counsel regarding reading preferences, as I'm sure all of us do. But continue to read him I do, over several decades. Not a rebel, not a polemicist, hardly a rabble-rouser who makes speeches and writes incendiary essays against injustice, Ashbery is an aesthete, a contemplator, an intelligence of infinite patience exploring the spaces between what consciousness sees, the language it develops to register and comprehend experience, and the restlessness of memory stirred and released into streaming associations. Ashbery's are hard to "get" in the sense that one understands a note to get milk at the store or a cop's command to keep one's hand above their head, in plain sight. Ashbery's poems have everything the eye can put a shape to in plain sight, clouded, however, my thoughts, the cloud bank of memory. He wrestles with the still-engaging problems of Aristotle's metaphysics, that the things in the world are only the expression of an Idea of that thing, which exists prior to manifestation. It's a slippery metaphysics, a guarantor of headaches, but Ashbery wears the problem loosely; he pokes, prods, wonders, defers judgment and is enthralled by the process of his wondering. Reaching a conclusion for him seems to mean that he is done writing, and no poet wants to think that they've used up their vocabulary. One might think that the mtvU audience might be more attracted to arch-romantic and decidedly urban poet Frank O'Hara, whose emphatic musings and extrapolations had equal parts rage and incontestable joy which gave a smile or a snarl to his frequent spells of didactic erudition. He was in love with the popular culture, with advertising, movies, the movies, he had an appreciation of modern art, he loved jazz and ballads, and he loved being a City Poet. He was more the walker than Ashbery, I suppose, or at least he wrote more about the going to and coming from of his strolls. unlike Ashbery, O'Hara loved being an obvious tourist in his own environment and didn't want for a minute for his poetry to leave the streets, cafes, and galleries where he treads. Ashbery is more the stroller who gets lost in his associations triggered by what he beheld. Ever more the aesthete than his fellow New York Poets, he was interested in things a little more metaphysical, that being that the reality that exists in the inter-relations being the act of perception and the thoughts that are linked to it, which branch off from the perception and link again with another set of ideas, themselves connected to material things observed and remembered. O'Hara was immediate, like the city he loved, while Ashbery allowed his senses the authority to enlarge his perception, to explore the simultaneity of sight and introspection. In a strange way, Ashbery is the more sensual of the two, willing to examine that even the sacrifice of immediate coherence. I’m not a fan of difficulty for the sake of being difficult, but I do think it unreasonable to expect poets to be always unambiguous or easily grasped. Not every dense piece of writing is worthy by default, of course, and the burden falls on the individual talent. Ashbery's writing, for me, has sufficient allure, resonance and tangible bits of the recognizable world he sees to make the effort to maneuver through his diffuse stanzas worth the work. Poetry is the written form where the ambiguity of meaning and multiplicity of possible readings thrives more than others, and the tradition is not a parsimonious use of language, but rather a deliberate expansion of what words pieced can do, what meanings they can evoke, and what sensations they can create. The prose is the form that is, by default, is required to have the discourse it carries be clear and has precise as possible. Poetry and poets are interesting because they are not addressing their experiences or their ideas as linear matters subject to the usual linguistic cause and effect; poetry is interesting because it's a form that gives the inclined writer to interrogate their perceptions in unexpected ways. The poetic styles and approaches and aesthetics one may use vary widely in relative degrees of clarity, difficulty, and tone, but the unifying element is that poetry isn't prose, and serves a purpose other than the mere message delivering that is, at heart, the basic function of competent prose composition. This may be the closest thing to straight-talk your likely to come across from a John Ashbery poem, a brief meditation on how emotional attachment to otherwise vivid memories wanes as you age. Yet even in its brief two stanzas and spare outline, this poem manages to bring two signature Ashbery traits to its center, elusive but not aloof. It suggests that just as the planet is formed by forces of weather and natural occurrence, forces that exist precisely because the earth exists at all with innumerable ecosystems shaping its profile over a great many eons, we also come to be formed by the cumulative logic of our choices over time. Where once youthful ego and naive philosophy gave us the surety that we were the captains of our own fate and were superbly equipped to navigate by invisible stars, we find ourselves with the slipping of years in cities, occupations and with hobbies formed by the life we thought we created from whole cloth. Man makes his tools, and then the tools make the man. In Ashbery's poem, our enthusiasms have ceased to be passions, an animating force of character, and are now, wizened with years, tested by experiences great, tragic and mundane, a cluster of traits, inconsistent habits of mind that haven't a coherent center but rather a shambling direction; inclinations rather than agendas. The glory of planting one's flag on a patch of earth with it mind to transform that acre and the acres around into a kingdom that will bear your name on signs and in memory becomes a hallowed shape. Not that we are required to remain hard-wired in stubborn habits and soured romanticism in our old age; Ashbery is a poet who cannot help but remain engaged with the world that has usurped his youthful mandate. Even as days, weeks and months go by faster in old age, the poet views what was the soil which was his metaphor for self creation and brings something from decades of life; what was formerly merely raw material waiting to be formed by an aesthete is now filled with nuanced shades, tones, subtle rhythms in the close details of trees and their leaves, tall grass. The world again provides you with something to consider and absorb whenever you're finished tending the wounds of the ego that is recovering from a protracted disappointment. I've thought for years that the best way to read John Ashbery's poetry is to first throw the instruction manual away and then go for a fishing trip in his various lakes of opaque meanings. Literally, imagine yourself in a boat in the center of a large body of water and cast a line into the water, and then reel in what pulls and makes the line go taut. Whatever comes up is always a surprise, unexpected, perhaps a tangle of things that wouldn't be bound together or linked in any conceivable but in the dreamy but sleepless realm of Ashbery's actively processing mind and attendant imagination. This might be the closest an American writer has ever come to transcribing the language of their thought process; for all the conventional wisdom about Ashbery's associations with painters, French surrealists and the rush of popular culture, he very closely resembles the method of Virginia Woolf and the still engaging, if topically staid process of stream-of-conscious. Ashbery's poems are filled with much of the material world, both natural and that which is manufactured, fashioned, contrived and constructed by human agency. In both Woolf and Ashbery, the central voice, the observer, distanced or not, renders an image, makes it solid and substances, gives it attributes and distinguishing nuance, allows the thing to be played with as the mind associates, puns, constructs parallel universes and contradictory timelines; sections of books, a cold cup of coffee on magazine, a painting under a cloth, shorelines seen from Italian villas, comic book heroes and the breathing of a grudgingly referred to "you" who is voiceless, without input. I was aware that Ashbery was an adherent of Wallace Stevens and his notion of the Supreme Fiction, a reconfiguration of the tension between Idea and it's physical expression to the senses. 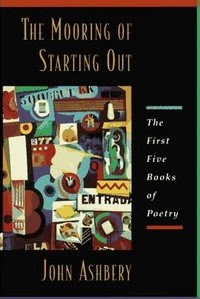 But where Stevens constructed a grand rhetoric to address the generic formulations of every day--his poems often times sound like critiques of a reality that is inferior to a divine Idea that makes their formation possible--Ashbery makes more informal, casual, and brings the distanced bewilderment to street level. There are glimmers, glimpses, observations, and sightings of the physical detail that assures you that you and Ashbery are living on the same planet, and yet at precisely the moment you come to a reassurance, these details blur and merge with the spillover of many other chats and conversations the poet seems to be having. The poems are not monologues, and one cannot call them a "medley of voices", as Richard Poirier had referred to Norman Mailer's Why Are We In Viet Nam?. "Medley" implies an orchestration of unlike parts made to harmonize, to make sense in ways that give pleasure. Ashbery's voice is singular, his own, and what comes from his typewriter are whatever arguments, debates, interrogations are rumbling through his consciousness at that given moment. While Ashbery is capable of the well-turned sentence and even sweet music on occasion, his aim isn't to give pleasure, but rather to make the ordinary and nettlesome extraordinarily weird. It's not that his poems are any more accessible than Stevens--his less daunting syntax actually seem to make his poetry more demanding than Stevens'-- but with patience we can comprehend a language we might actually use, a voice that could plausibly be one we would have in those moments of lost thought, daydreaming, vague yet intense yearning when there is so much we want to bring together for a moment of clarity but are frustrated to find that our senses keep changing along with the world they behold. Ashbery is the central poet for many critics whose projects intend to layout the rise of urban Modernism in American verse. Marjorie Perloff is someone else worth mentioning as much of who she deals with are city poets, worldly, college educated, unashamedly bookish, and unafraid to employ a more vulgar popular culture, IE comic books, movies, advertising, along with the more swank and sophisticated allusions to high culture, whether literature, opera, theatre, painting. A connecting thread through much of the poets emerging after WW2 was their ambivalence to the plenitude of culture and media--Dwight McDonald's derided mass culture--and began, in their individual endeavors, to fashion particular styles to sift through the cultural dumping ground each of them was witnessing. Elizabeth Bishop is exquisitely hermetic in her verse and is much closer to the qualities Stevens praised for poetic surfaces calling their own form into question, and James Merrill, who was something of a virtuoso in sustained, whispering elusiveness. One sees why some of the poets of the New York School receive more attention from readers and critics, especially the work of Ashbery and Frank O'Hara (and to a lesser degree, the wonderfully digressive poems of Ron Padgett); meanings and intents about the growling contradictory messages of physical reality are dealt with as unresolvable conditions of existence in the work, but the point is how the poet is engaged with their world. It might be said that Ashbery's work makes no sense, and conveys a sense of witness to an ever blooming enlargement of perception. The poetry of the New York School was, in essence, about talking about the world as it unfolded, an attempt to give a cadence and rhythm to the kind of personality which bears witness to the confluence of sight, sound, and smells.This is a fitting rite for a city that is in your face, traffic lights, pedestrian density and raw-lettered advertising, the moment you step out the door of your apartment building; everything is seemingly noticed, nothing is trivial, everything is a part of the story. Sheer meaning, hard and fast, is not be found here, but feeling, resonance, introspection are, and it is this several layered ambiguity that keeps a reader up at night, staring out of the window, testing the keyboard as ideas about what we haven't thought about comes in phrases even God himself couldn't explain.O'Hara is not so oblique or confusing--he is popular precisely because he has the lyric capacity to merge his far flung loves of high and low culture and still carry on a rant that achieves a jazzy spontaneity--he is the poet from whom Billy Collins has taken from and tamed for polite company. Ashbery is the stroller, the walker in the city, the flaneur, the sidewalk engineer examining the city in it's constant self-construction, composing a poetry of association that accompanies a terrain of things with inexplicable uses.W hat seems like a mighty muddle in his writing becomes full engagement of a personality in love with what the senses bring him; at his best the intelligence of the poems is transcendent and there is , in the main, a tangible joy in how he phrases his reactions, responses and retorts to a world that always seems to baffle him in some wondrous way.